This small village, resting at the point where Breckinridge, Meade and Hardin Counties join, was once known as the "Dodge City" of its time and place, due to the three saloons and violence in the town. In the early days, because of its location, Big Spring did not receive attention from law enforcement officials as did other towns. According to legend, it was a bit of a "wide-open" town; another legend tells how people enroute to Big Spring were cautious about traveling through the "long hollow" east of town, especially at night because of robbers. The quiet, peaceful and serene little town of today in no way reflects the period of time when Big Spring was a thriving center of trade, commerce, tourism and recreation. saloon, and served as the town undertaker. The little group of buildings comprising Big Spring sit there, sun-baked and wearing the look of age. They not only look old, but they are old, some dating back to the pre-Civil War era. Surely, if the buildings in the small village could talk, they would tell stories about struggle, strife, drama, courage, tr4agedy, affection, happiness, and examples of "man's inhumanity to man." Stories could be told about the early pioneers, Thomas Lincoln's visit, and the days when Big Spring was the "shopping center" for a wide area of the state. Stories could be told about the Civil War, of prisoners being held in the cellar and being shot as reprisals. Stories of guerrillas and the terror they brought could also be told. 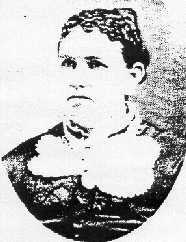 According to local legend, Sue Mundy, one of the most vicious of the guerilla leaders, was captured near what is now Irvington. Mundy was brought to Big Spring and held in the cellar of the old general store, the one that burned in recent years. He was then taken to Louisville, where he was executed by hanging. More stories could be told, some of which would be about runaway slaves being held in the cellar while waiting for their masters to come for them. Wile the dates of first arrivals in the Big Spring section are not known, they are thought to have been during the late 1770s. 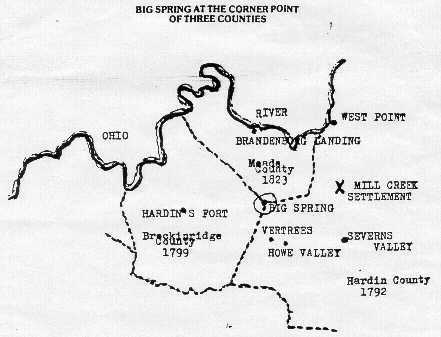 In 1780, Captain William, (Big Bill) Hardin, with his party, came down the Ohio River to the point where Stephensport is now located. They turned up Sinking Creek to the falls, where they landed. From here, they journeyed over land to find a suitable site on which to build a fort. Sometime later, the men discovered they were being followed by Indians. In order to avoid a fight, they abandoned their plans and set out for Hynes Fort in Severns Valley (Elizabethtown). The men traveled all night until they reached a big spring where they paused to quench their thirst and rest for awhile. It was in this spot (presumed to be Big Spring) that the Indians overtook them and a fight ensued. A Mr. Sinclair was killed, the others escaped to Hynes Fort. Many towns in Kentucky claim the Lincoln family stopped there on their way to settle in Indiana. Big Spring, too, makes this claim and with probably more reason than most, as it appears to be a direct route to where the Lincolns crossed the Ohio River. It is claimed that Thomas Lincoln and his family made camp in a field near the spring on land owned by a family by the name of Board. One hundred years later, there were old timers in and around Big Spring who could point out the trail the Lincolns took. Some of the best farmland in the county can be found in the Big Spring area. In the early 1800s, many people began buying tracts of land for farms and businesses. Ernest Bewley, a 76 year-old resident of the town said, "My father told me many times that when land was first sold in this area it went for 12.5 cents an acre. This was in line with the wages, which were often no more than 5 cents a day." For a time, Big Spring was a stage stop for the coaches running between Elizabethtown and Hardinsburg (Hardin's Fort). The town gradually grew up in the early 1800s, around the clear, cool spring that risen in Hardin County. The spring flows about 50 feet, passing the junction of the three counties, then sinks and reappears several times. It finally flows underground for three more miles to emerge in the Sinking Creek, a tributary of the Ohio River. In early days, a large tree bearing leaves that were three shades of green was called the "Corner Tree" as it stood at the geographical point where the three counties joined. Big Spring residents claim that the leaves facing each county reflected a different shade of green. A granite marker now sits near where the "Corner Tree" once stood. Big Spring served as a summer resort for people from Louisville and other places who were seeking a restful place to get away from the heat and noise of a large city. At one time there were two hotels, which usually filled in the summer months. Some type of entertainment was always available for the many visitors. If the quiet became too pronounced, there were plenty of events and activities with which to keep busy. The most popular form of entertainment was found at the race track, owned by McHenry Meador, a prominent resident of the town. Many fine horses were owned by some of the citizens of Big Spring. Harness racing fans from all over Kentucky met there. At this time, there was a saloon where the men could quench their thirst and idle away time. Several red hot poker games were often held, and at times, someone would draw a knife or gun on a member of the game who was caught cheating. The county line between Breckinridge and Meade Counties was moved during the early days and happened to pass through the center of the tavern. With Breckinridge County being dry, and Meade County wet, the proprietor simply started serving alcoholic beverages across the room on the Meade County side. Herb Hodges, life-long resident of Big Spring said, "A fellow could buy a shot of whiskey in one county and go across the room to Breckinridge County and drink it. This often led to confusion when the sheriff tried to arrest someone. If the sheriff was from one county, and the criminal was across the county line, the law officer had no authority to arrest him. Often no arrests were ever made." Dances were often held in homes or the dance hall, and a ten-pin alley attracted the younger men. At different times of the year, there were quilting parties, corn huskings and apple peelings. Play parties were very popular with the summer visitors as well as the locals. For the more sober minded, there were two churches: a Methodist and a Baptist, at which they could worship on Sunday and attend weekly prayer meetings. Possibly the most exciting event that disturbed the serenity of this small village was the tornado that struck the town in March 1849, killing several citizens and destroying several buildings. The Methodist Church was left in ruins, it was rebuilt in 1881; the Baptist Church was built in 1884. Near Big Spring one can easily locate Hurricane Hollow, named for the 1849 tornado that swept its length before hitting the community. Another catastrophe hit the community in about 1911, when it was almost destroyed by fire. The town has also survived several droughts and floods. In the 1870s, businesses flourished, a town plat had previously ..................... lots were sold to those wishing to settle in Big Spring. Vine Grove, 10 miles northeast of the busy little town, was the major shipping point. 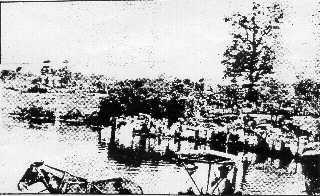 At this time the population in Big Spring was around 200. It was during this time that two physicians, Drs. J.R. Gray and C.B. Arnold, practiced in the town. The druggist was J.C. Smith. Other businesses included: W.A. Burkhart, blacksmith, J. Caldwell, barber; Eskridge and Brothers, blacksmiths; A. Grief, jeweler, tinnier and trunkmaker; T.B. 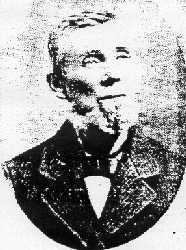 Howard, hotel proprietor; McHenry Meador, general and furniture store owner and undertaker ..... (missing text) ..... (mayor); T.A. Robinson, carpenter; James O. Sturn, furniture; and G.A. Meador flour mill operator. At one time, Big Spring supported a large distillery, owned by Jim Wheatley. It was located behind and to the right of the Clarkson - Hardaway mansion. The whiskey made at the distillery was known as "Big Spring Straight." Since it was not sold in bottles, customers had to fill their own containers from spigots that were on the end of each barrel. 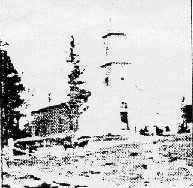 THE OLD BIG SPRING METHODIST CHURCH was the scene of this picture made in days gone by. The church once had a membership of 230. At that time Big Spring was a larger community than Elizabethtown. If you can identify anyone in this picture please let us know. Left: This picture was made of the old Methodist Church following Sunday morning worship.